The Enterprise travels to planet Pyrus VII and discovers alien visitors that attempt to connect with human consciousness but wind up tapping into the regions of human nightmares instead. This episode is the Star Trek Halloween Special of 1967. "Catspaw" is episode #36, production #30, and was first broadcast October 27, 1967 and repeated on May 24, 1968. It was written by Robert Bloch, and directed by Joseph Pevney. Its Gothic horror elements are in keeping with the proximity of the episode's release to Halloween (31 October). Bloch based his teleplay very loosely on his short story "Broomstick Ride". A fun, campy episode. About as goofy as Trek gets, but knowingly goofy. You can tell they got a kick out of making it. I tend to be very forgiving of the special effects in TOS, but the wires on the little pipe-cleaner alien marionettes really are ghastly. Apparently they cleaned those up for the remastered version, and that's a change I don't mind a bit. The design of the aliens is nicely weird, and the pitiful little chirping noises they make are memorable, but those wires make the scene look like something out of a Krofft Saturday morning show. A fun fact: according to Memory Alpha this is the first episode to feature the full classic cast of Kirk, Spock, McCoy, Scotty, Uhura, Sulu, and Chekov. A not-fun fact: Theo Marcuse, the actor who brought such wonderfully hammy conviction to the role of Karob the evil space wizard, died in a car crash just a month after this episode aired. I don't remember noticing the puppet strings as a kid. This was a great episode with one of the first appearances, I think, of the post-scarcity "why would we need gold?" trope. It may well be that the wires didn't show so much on older TVs. A while back I saw the episode on a 1990-something TV and the wires were hard to ignore. D'oh! He's Korob, not Karob. This was a great episode with one of the first appearances, I think, of the post-scarcity "why would we need gold?" trope. Yeah, maybe, but in this very same episode, DeSalle says he'd bet "credits to navy beans" that the Enterprise could "punch a hole" through the planet's force field. Money, trade, and economic activity is very much a thing in Star Trek*. It is mentioned or referred to in nearly every single episode, claims of the ability to synthesize gold and gemstones notwithstanding. Note that this is not the same as claiming the ability to synthesize a sweater, say, or a cup of teaearlgreyhot. The Trekosphere being explicitly a "post-scarcity society" came with the 1980s and later incarnations. If memory serves, that sort of techno-utopian thinking didn't go mainstream until long after Star Trek was cancelled. 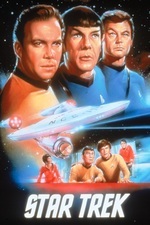 *Star Trek (1966-1969) and I are old friends on a first-name basis. No bloody A, B, C or D.
The episode The Devil in the Dark takes place at a mining colony, so clearly the ability to synthesize minerals has its limitations. Also, Spock says, "The cat is the most ruthless, most terrifying of animals," which needs to be a T-shirt and a Tumblr meme.